The clouds rolled slowly up and over the edge of the sheer cliff face, forming the illusion of a tablecloth draped snugly to the rock. The valley 500 meters below was nothing more than a memory and the idea of driving the dirt and gravel switchbacks that passed down through it was not one that any sane person would relish. 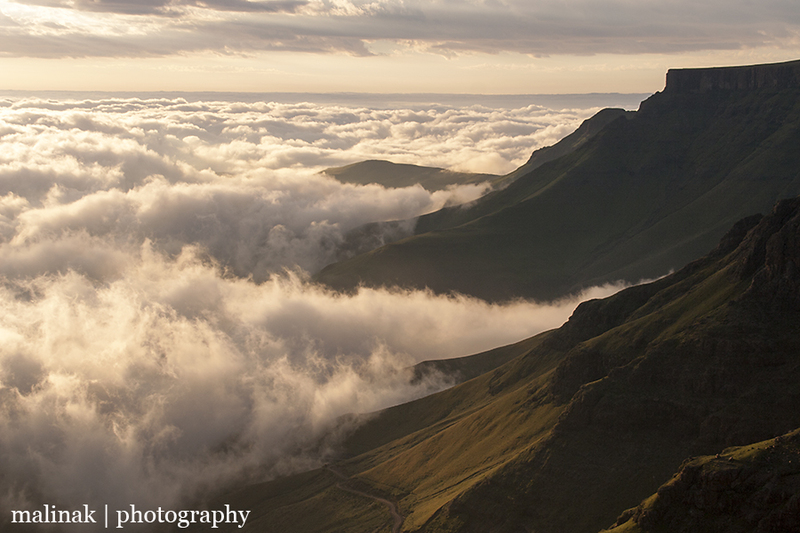 The top of Sani Pass is not for the faint of heart. 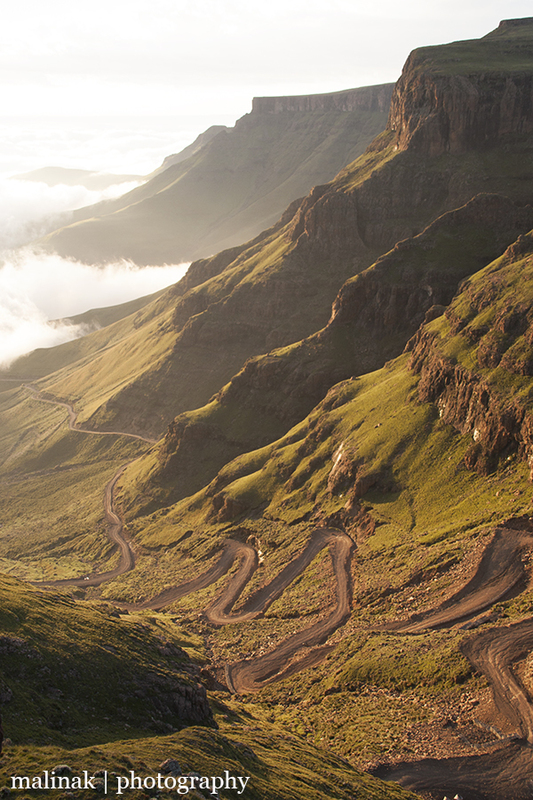 Sitting nearly 2900 meters above sea level right on the edge of the Drakensberg escarpment, this road pass is one of Southern Africa’s rites of passage for adventurous souls. The road climbs over 1300 meters in only 10km with the last kilometre being nothing but ridiculously sharp switchbacks up a nearly sheer wall of rock. It is the only road pass between South Africa and Lesotho for hundreds of kilometres between the far southwest and northeast of Lesotho. Nearly half of the circular border of Lesotho has no road passage to South Africa, except Sani. On a clear day the Drakensberg mountain range can be seen from the city of Durban about 90km away. On a cloudy, fog filled day, the mountains can’t be seen from 90 meters away! Thrown up millions of years ago, this terribly imposing mountain range stands guard between the coastal plains of South Africa and the rugged interior of Lesotho. A group of us set off from Maseru early on a Friday and nine hours, 300km and lots of bumpy roads later, we arrived at the top of Sani Pass. The road from Mokhotlong to Sani alone is only about 50km, but it takes about two hours on the unfinished dirt roads. The views along the way are breathtaking, as you snake along river valleys and up through mountains, including Thabana Ntlenyana, the highest peak south of Mt Kilimanjaro on the African continent. The top of Sani is covered by huge expanses of pasture land cut by small streams formed from run off of the mountains that tower ever higher. Right on the edge is Sani Mountain Lodge where you can sit on an outdoor deck and look straight down the dirt track that vaguely doubles as a vehicle road. Sitting in what is claimed to be the highest pub in Africa, you can’t help but marvel at the spectacular views of mountains all around and the huge drop off right in front of you. We decided to camp as our dog Mosa wasn’t allowed in the chalets. 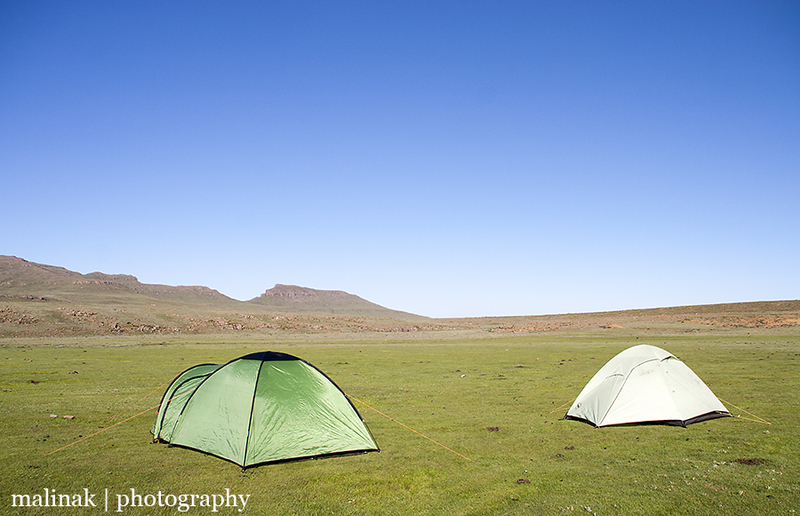 We, along with our friend Heather, set up our tents in the middle of a field with the doors facing away from the little village looking out over the pasture and towards the mountains. At first it was perfectly sunny and clear, but by the time we got back to the tents after dinner clouds had started rolling in. As we zipped ourselves into the tent, we couldn’t even see the car five metres away. The cloud swept in thick and low and stayed there throughout the night. The morning brought clear sunshine and an amazing sunrise over the clouds down below in the valley. The soft morning light played against the towering cliff face and we witnessed our first proper sunrise on the African continent. It was quiet, majestic and awe-inspiring to stand high above the clouds and watch the sun break through and bring warmth to a new day. Our hike towards Thabana Ntlenyana, the ‘beautiful little mountain’, took us deeper into the mountains away from the cliff edge. The rest of our group made it up to the top, but unfortunately five month old Mosa was not strong enough yet to undergo an eight hour hike up more than 600 meters of climbing. On our way back to camp the clouds started rolling in fast as we approached the edge. A barren landscape with far more sheep and cows than people, it took on a haunted spectral quality when the clouds started rolling in. When the sun was out though, the green fields and blue sky were about as vibrant as you could imagine. A schizophrenic landscape filled with malice, it is still amazingly beautiful. We sat on the balcony completely shrouded in cloud and then retired to our tent, where we watched the clouds roll across and then dissipate just as quickly, only to return again within five minutes. It was a surreal experience to watch such variable weather. After a lovely couple of days, we then made our way down the pass. It is slightly harrowing, but completely reasonable in dry, clear conditions. Everywhere you look there is something more amazing to see – sheer cliff walls rising hundreds of meters above you, waterfalls crashing down off the rock faces and even a troop of baboons wandering through the brush. We took our time and admired the scenery, content to feel overwhelmed by the power, glory and majesty of nature. Here are few more captures from our spectacular trip to Sani Pass… Thanks to David, Brian, Heather, Bettina and Emma for a wonderful weekend exploring with good friends!